For those readers who might be interested, this post provides a few more technical details about our flight plans…. 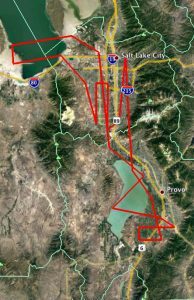 For this study, we planned three different flight patterns that cover the Utah, Salt Lake, and Cache Valleys (described further below). Besides collecting data that is distributed across the region, these flights also include elements that allow us to measure the vertical structure of the atmosphere. (Yes, the atmosphere has layers!) 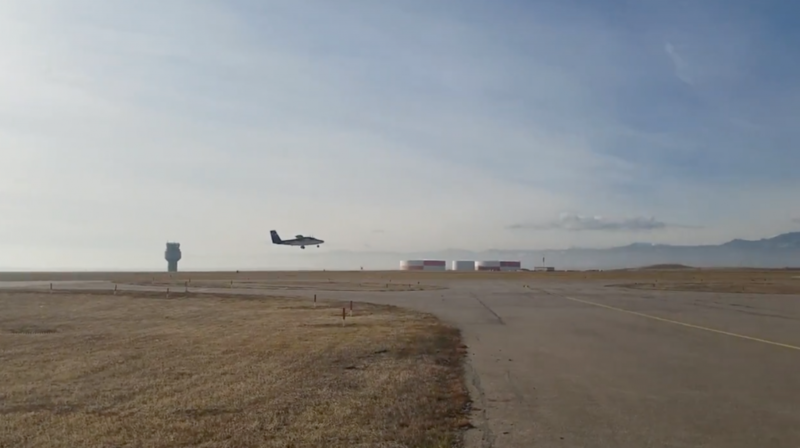 The first of these is called a “missed approach”, when we purposefully descend towards a runway and then pull up once we’re 15ft – 50ft above the ground. This maneuver allows us to measure the compounds that are present in the lowest surface layer of the atmosphere. This layer frequently has the highest concentrations of pollutants since they are emitted from sources at the surface. This is especially true during inversion events when these pollutants are trapped near the ground, which can cause respiratory irritation for people living in the affected areas. It is expected that each location where we do a missed approach will have a slightly different chemical composition, dependent on the local emissions. The second element is a spiral. When we fly spirals in this campaign, we climb in a corkscrew pattern from ~5000 ft to 12,500 ft above sea level (SLC has an elevation of ~ 4300 ft). Spiralling allows us to isolate the vertical and horizontal structure of the atmosphere by measuring changes in composition with altitude at one particular location. This can help us determine the vertical depth of the inversion layer at certain locations and when flown over multiple days and nights, can provide information about how these events are changing over time. This is not only helpful to those of us studying the chemistry of inversions but can provide information about wind direction and speed at high altitudes, which is helpful to improving meteorological predictions. Here in Utah, it also provides a chance to get over the mountain tops and travel into another valley. The first route is the “Northern Loop”. We take off heading north out of Salt Lake International Airport, do two missed approaches at Ogden and Brigham City airfields, then spiral up over the mountains to make our way into the Cache Valley. After surveying Cache, we climb over the Wasatch range and drop into Bear Valley. 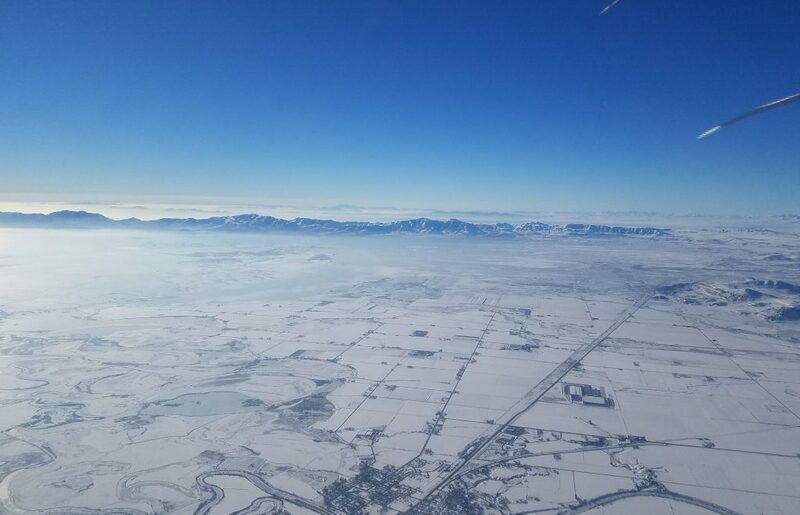 From there we make our way over to the Great Salt Lake, fly around a U.S. Magnesium plant on the southwest side of the Lake, do another missed approach in Tooele Valley, and finally cross back over to SLC and return to the airport. 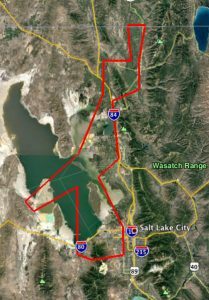 The “Southern Loop” begins with a takeoff out of Salt Lake International and then does two passes over the Great Salt Lake to the west. Once over land, the plane does a missed approach at South Valley and then flies a raster pattern over Salt Lake City. This pattern (sometimes also referred to as a ladder) allows us to observe how emissions from the city are chemically transformed as they travel horizontally, as well as identifying variations in emission types and amounts across the city. At the southeast side of Salt Lake Valley, the plane spirals up over the mountains and down into the Utah Valley. Here there is a missed approach in Provo, a box around southern Provo, and then another missed approach at Spanish Fork. After making two passes over Utah Lake (which is freshwater and currently frozen), the plane navigates through the Jordan Narrows, and if there is enough fuel left, will conduct boxes over SLC (see “SLC Boxes” below) before returning to the airport. The last route are the “SLC Boxes”. Although the least interesting flight plan, the data from this route might prove to be some of the most interesting. 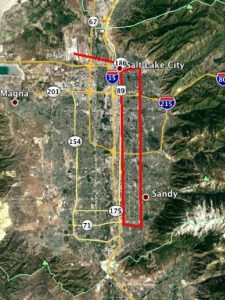 The idea behind this flight plan is to repeatedly fly a box pattern directly over Salt Lake City at different altitudes or different times of day to show how inversion conditions chemically evolve over time. This information is helpful to understanding how certain types of emissions (i.e. cars, industrial plants, wood stove burning) can lead to aerosol formation, which is harmful to human health. With this information, we may be able to identify emission sources that have the most impact on aerosol haze that forms during inversions, which could ultimately lead to emissions reductions and cleaner air. Each flight pattern was designed to pass over many of the EPA and University ground research stations in the area. Instruments at the ground stations are continuously operating and flying over them in the twin otter can provide even more information about vertical variations of the atmosphere and valuable comparisons between instruments.